We are manufacturer and exporters of various silk based grey fabric with wide range of fabric including satin fabric, plain polyester/polyester fabric, cationic / nylon fabric, silk fabric, spun based fabric, polyester spun satin and many more with different design, which are further used for making hi-fashion garments and saree both for global and domestic market, this type of fabrics are used in the various purpose like digital print, dyeing and mill printing. Our mission is to create a transparent and digital supply chain that creates direct sourcing relationship between buyers and sellers around the world. Our weaving section provides following products basket. Cationic by nylon- different design & pattern. The weaving design is equipped with 64 world class water jet Looms to produce fabrics a grey width of 49" (124 cms ) to 74" (188 cms). All our looms are equipped with 2 & 3 nozzle weft options and dobbies to offer the maximum flexibility in production. 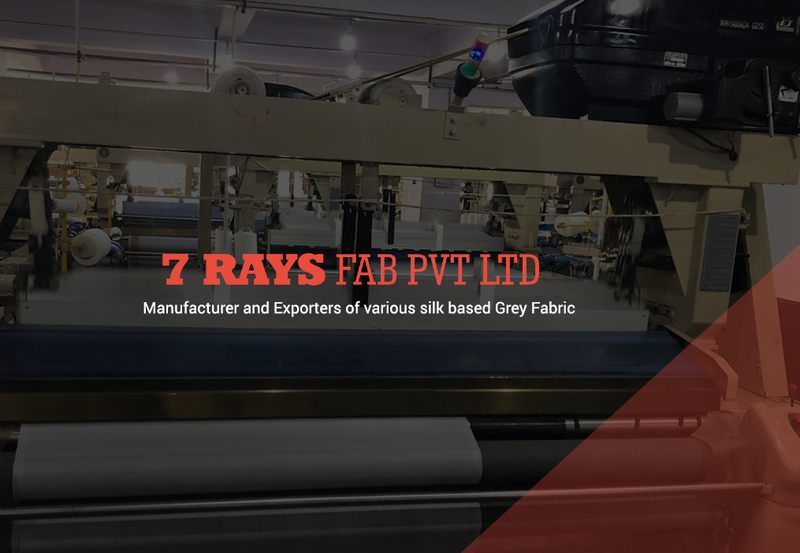 The weaving division uses yarn different raw material like roto base, micro base, polyester, spun polyester, nylon grey fabric, cationic by nylon satin fabric etc. Also equipped with other machinery like tfo, warping, the team is capable of handling the most difficult fabric with ease. Inquiry We provide pure Silk Woven Fabric�used for variety of purpose like home furnishing, apparel and others. The vast color range and high quality of this Silk Fabric makes our range exclusive. This extremely high quality Indian Silk Fabric with excellent look and feel is offered on pocket friendly price. Inquiry We are a professional manufacturer and exporter and our expertise in Greige Khadi Fabric. It is extremely versatile and its uses are limited only by our imagination. Greige Khadi Fabricis also one of the world's most breathable materials.We take pride in quality of our products, competitive price and the customer experience. Inquiry With a wide assortment of Satin Plain Fabric�Producer for the domestic and overseas markets in a fully integrated plant. It is one of Turkey's leading manufacturer of these type of fabric. Offered Satin Plain Fabric that are developed using quality material and conform to international standards. Inquiry We are pleased to present our self as manufacturer and exporter of Moss Satin Fabric. These Moss Satin Fabric available in different width & color as per your requirement. Moss Satin Fabric are designed by our skilled professionals using superior quality fabric in adherence with set industry norms.